PARIS --- The four Eurofighter partners face major decisions over the next couple of years, as two of their four final assembly lines begin running out of work in 2018, and production of major components faces a two-year suspension until it resumes in 2018 for the aircraft ordered by Kuwait earlier this year. Coping with the end of production will create complex management challenges for the four partner companies who own prime contractor Eurofighter Jagdflugzug GmbH, (Airbus, with 46%, BAE Systems with 33% and Leonardo-Finmeccanica, with 21%, according to the latest shareholdings), as well as a loss of revenue that will lead them to decide whether to claim compensation from the four partner governments for the substantial cuts in overall production numbers since the “umbrella contract” was signed. Closing down a final assembly line is akin to the kiss of death in a market as competitive as the one for modern combat aircraft, and what dissuasive effect closing not one, but two, FALs might have on prospective customers can only be guessed. Boeing (with the F-18E) and Lockheed Martin (with the F-16) face similar problems, and both are scrambling to ring up new sales before they run out of work. Losing credibility in the market would be especially ironic for the four Eurofighter partner nations, as they are investing upwards of a billion euros to upgrade the aircraft -- notably by adding an AESA radar, an improved self-defense suite and new, more capable weapons – to make it more competitive and more attractive to prospective customers. However, the upgrade package has come very late in the game, and while it will substantially improve the effectiveness of their in-service fleets, it might not arrive soon enough for prospective buyers, who would look askance at the closing of final assembly lines or the hibernation of component fabrication. This is one of the reasons why the partner companies shy away from this issue. “We are not confirming any delivery figures publicly,” an Airbus DS spokesman said Oct 05, while a spokesman for BAE Military Aircraft said Oct 6 that “Based on current orders, aircraft will continue to be delivered until 2023,” wrongly implying uninterrupted production and glossing over the fact that BAE’s own final assembly line is due to close in 2018. Furthermore, information relating to production workshare and aircraft deliveries is no longer available on the Eurofighter website. The crux of the problem is that the two final assembly lines (FAL) operated by the German and Spanish units of Airbus Defence and Space will run out of work in 2018 and 2019, when they deliver the last aircraft to their respective air forces. 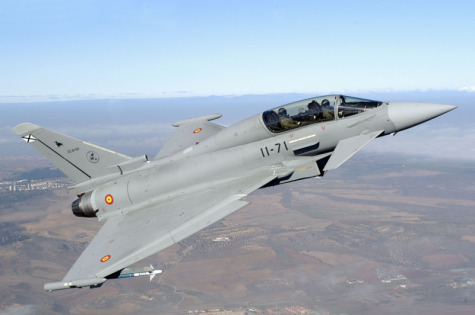 As of September, Airbus Spain had delivered 61 of 73 Eurofighters, with 12 left, while as of July 1 Airbus Germany had delivered 120 of 143 aircraft on order. Even though both are stretching out production as much as possible (by lowering production rates to 8 aircraft/year in Germany and 4 per year in Spain), it is inevitable that, without a new order, they will begin to shut down in 2018, either temporarily or permanently. * Final delivery to Kuwait tentatively scheduled for 4th Quarter 2022, but could slide into 2023. “After delivery of last German Air Force aircraft, the Airbus FAL at Manching will be interrupted until further‎ export contracts are acquired (capability to produce further Eurofighter in Manching will be secured) [but] assembly of centre fuselages will continue,” the Airbus DS spokesman said Oct 5, without explaining what they would be used for. The situation is marginally better in Britain, as foreign sales have helped to make up for large cuts in national orders. BAE says in its latest annual report that 18 Typhoon aircraft were delivered from the UK final assembly facility in 2015, of which 12 for Saudi Arabia, and in November 2015 the company decided to reduce its production rate to delay the inevitable. As of June 30, BAE had a backlog of 42 aircraft (22 for the Royal Air Force, 8 for Saudi Arabia and 12 for Oman), but contractual delivery deadlines limit its flexibility to slow production. Current plans call for BAE to deliver 7 aircraft in the second half of 2016, 17 in 2017, 12 in 2018 and the final 6 in 2019, when the British FAL will close unless BAE finds new foreign customers. In fact, it is Italy that seems to have best managed its Eurofighter assembly line, thanks to its recent 28-aircraft order from Kuwait. On current orders, it has a backlog of 42 aircraft, which will keep its final assembly line in business until end 2022 or early 2023 – four years later then its three program partners. Production schedules as of June 30 call for three more aircraft to be delivered this year, 5 each in 2017 and 2018, 3 in 2019, 9 each in 2020 and 2021, and the last 8 in 2022. As final assembly is winding down, fabrication of components will be suspended in three of the four countries, and will not resume until 2018, when new parts will be needed to assemble the 28 aircraft ordered by Kuwait. Airbus Spain will build its last wing in July 2017, for example, and Airbus subsidiary Premium Aerotech is now building its final center fuselage, after which their component production lines will temporarily close down for at least two years, Die Welt reported quoting a company spokesman. Several phone calls and an e-mail to Aerotech’s Head of Communications, Markus Wölfle, were ignored. In November, BAE Systems “announced a reduction in its build rate for Typhoon assemblies to ensure production continuity at competitive costs over the medium term,” which in simple words means they’re stretching out production as long as possible to avoid having to close, mothball and then re-open the lines on which it builds components and parts. Whenever they may happen, these production shutdowns will have financially significant consequences. For example, according to its latest annual report, BAE Systems gained £1.1 billion in 2014 and £1.4 billion in 2015 “under the Typhoon work share agreement with Eurofighter Jagdflugzeug GmbH,” the program’s nominal prime contractor, and this business will inevitably slow in the absence of new orders. By extrapolating from BAE’s figures, and based on current workshare, we estimate that in 2015 Eurofighter fabrication was worth about 2.7 billion euros to Airbus DS (the company does not break out Eurofighter revenue). Leonardo said in its annual report that revenue obtained through Eurofighter amounted to 897 million euros in 2015 and 898 million euros in 2014. Thanks to slower assembly, and the Kuwaiti contract, Leonardo will interrupt neither its final assembly line nor its component production until 2022, when the last Kuwaiti aircraft is to be delivered, a company spokesman said Oct. 7. Consequently, and alone among the partner companies, Leonardo will continue to benefit from steady revenue from the Eurofighter program until 2023, albeit it with a dip in 2019. 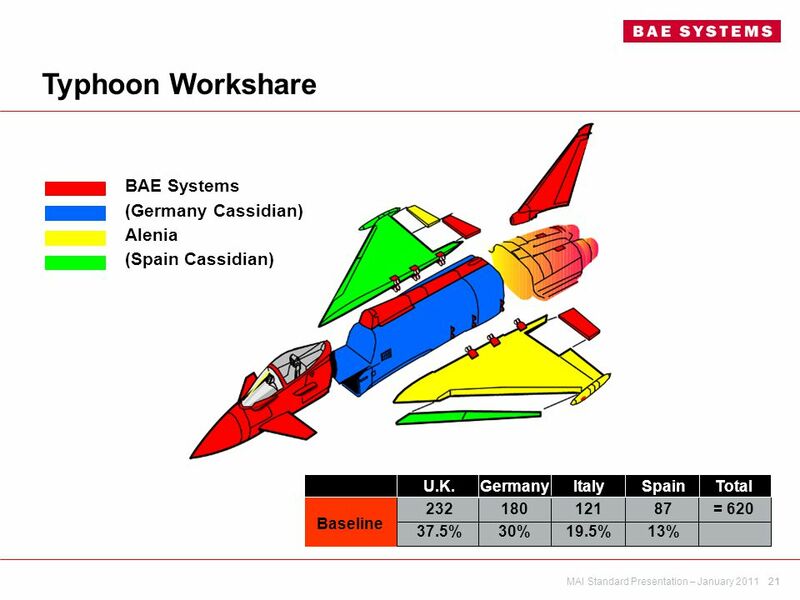 It should be noted that workshare differs somewhat from shareholding, as the respective production work shares stand at 43% for Airbus Defence and Space, 37.5% for BAE Systems and 19.5% for Finmeccanica. Compensation will look more attractive to Germany and Spain, which have achieved no export sales of Eurofighter, but could appear less justified for Britain and Italy, whose government-backed export sales (to Saudi Arabia and Kuwait, respectively) have partly compensated for cuts in national orders. The partner companies have not so far mentioned any figure for the damages they might be seeking, but Die Welt estimated them in the high hundreds of million euros in an Oct. 4 article. However, given that the German government has already fined Airbus for late delivery of the A400M airlifter, the company’s position regarding compensation and damages to be claimed from Germany and Spain, its two national customers, may be difficult to resolve. When the Eurofighter program was launched, the four partner nations signed a contract in January 1998 to jointly produce 620 aircraft: 232 for Germany, 180 for Germany, 121 for Italy and 87 for Spain; a clause also included options on another 90 aircraft. However, in 2009, the third production batch (known as “Tranche 3”) was divided into two parts: Tranche 3A, which was ordered, and Tranche 3B, on which governments deferred a decision until 2014. As Tranche 3B has now lapsed due to a lack of contract, final production for the four partner countries will be limited to 470 aircraft – a drop of nearly 25% compared to the initial 620, and so a substantial loss of business for the companies involved. Just the cancellation of Tranche 3B (124 aircraft) represents a major loss of business for the four manufacturers, and for which they are contractually entitled to compensation. European Eurofighter fleets are also due to shrink further by the end of this decade, when all four countries plan to retire their Tranche 1 aircraft, which they have been trying to offload on the world market for some time. This means that these aircraft will not be upgraded beyond minor improvements to their avionics to keep them current, so industry will lose another revenue opportunity on the program. Tranche 1 aircraft in service currently total 133 aircraft: 28 in Italy, 18 in Spain, and 33 in Germany, but the biggest operator is the Royal Air Force, which has 53 in service. Originally due to be retired in 2019, the latter may in fact serve longer and equip two new Typhoon squadrons that the British Strategic Defence and Security Review revealed would be set up for the air policing / QRA mission. Germany and Spain currently have no combat aircraft to follow Eurofighter production, and although the UK is a major production partner for the F-35, it will not have a final assembly line of its own. Again, Italy seems to have best managed its transition out of the Eurofighter program, as it is already producing F-35 parts and is already assembling aircraft on a new, government-paid but Leonardo-operated Final Assembly and Check-Out (FACO) line at Cameri, near Milan. After Eurofighter production ends, only two relatively small, family-owned companies will be able to produce European combat aircraft: Dassault Aviation of France and Saab AB of Sweden.